Let me first apologize. I owe you one Scotty. I made a callous, uninformed judgment when I jumped to the conclusion that Jay-Z’s Blueprint 3 album would trump yours because truth be told Jigga did work from track 1 all the way to climactic ending with Young Forever. At that time I had not given a complete sit down, full listen to your album and even when I first tried to give it a full listen, it was in more of a party setting, which resulted in me skipping to the songs I knew. Needless to say I went straight back to your album and put the first track you performed in that video, Cudi Zone on non-stop repeat. Soon after, I felt an overwhelming guilt for not taking the time to actually listen to every track and soak it in. After soaking it in, here’s how I felt. The first thing you need to understand is that Kid Cudi or Scott Mescudi as people in the Cleveland, Shaker Heights area know him as, is a very very complex dude. His album Man on the Moon: The End of the Day is very intricately pieced together, sort of following a play or movie as the songs have been pre-organized as one huge dream with the Acts portraying different emotions that he has experienced and is now choosing to put in display as he takes us on a journey into the depths of his subconscious. The first track, In my Dreams, begins Act 1: The End of Days. It’s more of a dreamy interlude that could very well put you to sleep and give the wrong impression of his album if you were looking for something more “Hip Hop”. Looking back it does a good job of throwing up a huge caution flag to everyone listening letting them know that the journey he’s about to take you on is not going to be your typical Hip Hop, skin deep type of music. Additionally, Common’s first monologue at the end of the first track beginning with “Long before we know ourselves, our path are already set in stone, some may never figure out there purpose in life and some will…” does a good job of foreshadowing what is to come from Cudi. He plays the narrator to Cudi’s story warning us that the following is a story of struggle where a young kid from Cleveland found his way and did it in way that no one else has done before. “I try to think about myself as a sacrifice, just to show the kids they ain’t the only ones who up at night"
Moving on to the third track Simple As…which continues his trippy, out of this world dreamy vibe, except in a more upbeat, matter of fact way. The track has a more happy go luckily tone and Scotty jumps all over the place mentally attempting to simplify life with things you’d think just walking down the street to yourself. Pretty short track, but provides an adequate contrast to the previous song, preventing listeners from getting to bogged down in his at times rugged tale. Cold cold world wasn't fit for me at, all"
Overall eerie track that will surely strike a chord with your inner craziness. Again though, a depressing song is followed by the epitome of inspiration with the track Heart of a Lion (Kid Cudi Theme Music). Here Cudi emanates sheer courage looking his issues and insecurities in the face and ultimately putting them to rest through a volley of positive energy and bravado through his “No one can stop me” tone. Very upbeat and encouraging anthem that preaches no matter how depressing your last thought (or song in this case) was, at the end of the day you should be walking with a Heart of a Lion. The end of the second act is more of a slowed down, monologue longing for that “I made it and I’m successful” moment with the track My World. He goes back to all of the experiences that have led up to this now exciting point of his life where he can sit back and admire all the day to day adversity he had to go through to get out of this depressing Night Terror faze. Now onto his stoner section of the album with Act 3: Taking a Trip. Obviously everyone is familiar with Day n Nite by now as this was the first song that got Cudi on the map. I found it incredibly cool how he came up with the concept and explained in the video above how he first came up with the melody and even gave a beatbox sample. The whole aura of this track really appeals to the inner loner in everyone that seeks to free their mind at night to get away from the world by letting go detaching themselves from the world to keep their sanity. Very well conceived melody…. Which leads to the next single Sky Might Fall, which was produced around the time Kanye was going through his depressing state that led to the dark sound of his album 808s and Heartbreak. The beat fit perfectly with the concept of Kanye’s album and also fits well with the detached from reality feel of Cudi’s album. I personally liked it a lot because despite the somewhat depressing lyrics, it finds a way to be positive and inspirational through Cudi’s delivery. It offers such a contrast because the tone of the verses are somber, but as he gets closer to the chorus he builds strength and gains positivity, serving to brush off and overcome those sad feelings holding him down. The song preaches a great way to life live because the sky might just fall tomorrow as fate would have it, but going around thinking about that is nothing but a waste of time. This one will always be one of my favorites and always hits the spot after a depressing day. Personally I thought the song fit really well into promoting Transformers: Revenge of the Fallen and was a little upset it wasn't in the movie and they only used it for the trailer. The final track of Act 3, Enter Galactic (Love Connection 1) serves as the ice to cut the previous two lyrically deep 100 proof songs. Again, a place holder track to keep the roller coaster dream from getting to high or low. Common ends the act prefacing a different turn in the dream away from the psychedelics and onto the positive inspirational section of his imagination. Try and be the same b*tch you know you're not a sequel"
That verse is so badass words don’t do it justice. Not necessarily through the creativity of his lyrics, but by his sheer audacious delivery and stone cold diction. He relies heavily on his poetic stop-and-go, rolling, syllabic elocution as he hops from word to word impeccably winding his way through the measured claps of the beat. It’s awe inspiring and every time I get to that part of the track I rewind it out of instinct. That verse furthers the notion that he is the Moon Man because stylistically he’s able to reach a creativity plateau through a combination of delivery mixed with beat and rhyme that’s so strikingly different both from much of what Hip Hop has to offer, it’s simply exciting. Moving on to my now second favorite song on the whole album titled Cudi Zone. Again if you skipped the video above, I’ll forgive you, but at this point you may as well scroll back up and watch the first 4 mins and 18 sec of the video. I’m serious, I’d rather you watch that more than read any word on this whole review. He does more in the performance of Cudi Zone that my words could never measure up to experiencing it firsthand as concrete evidence. Needless to say the track can best be described as an orchestrated outpouring of melody. 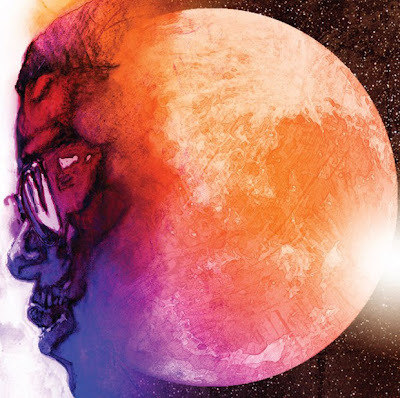 Emile (the producer of the song) did an excellent job of creating a dramatic, upbeat, energetic violin laced beat that sets the tone for Cudi to march through the track emphasizing that out of body feeling of euphoria when you’re in the zone. Everyone strives to find that peace up mentally and this song erupts with such raw emotion that you can’t help but be inspired to feel good about life and FORGET ABOUT IT ALL. On a person level, I for one have had many moments this past year where I’ve struggled to find that peace up there and get in that zone to just get away from it all…this song takes me up there, it takes me to that place where I feel like "oooooohhh", where you’re zoned and are able to regain perspective and just be happy with life. Daps for this one Cudi, your outpouring of emotion has had a very real effect on at least one of your listeners. Make Her Say (Poker Face) doesn’t need much of an intro or explanation, it’s a creative sample of Lady Gaga’s radio hit. Despite it’s dancy, fun upbeat feel, its probably one of my least listened to tracks on the album. I really do like Common’s verse though, solid collabo, lot's of real Hip Hop talent on this one. "I'm on the pursuit of happiness and I know everything that shines ain't always gonna be gold I'll be fine once I get it....I'll be good"
The verses paint a tragic, hard headed, myopic, I’ll be fine on my own, leave me alone, I’m a loner, no one understands me picture. Alternatively, the message in the chorus is very fitting and I think I like this song so much right now because of the parallels I can draw to it with my own personal life. It’s all about expectation, as long as you can remain initially skeptical that whats shining isn’t really gold, you’ll eventually find gold and be good. It’s the times you believe without a doubt that once you see the shine, you immediately assume its gold before examining it where you get in trouble. Someone once told me I like to over analyze things…don’t act like that little snack didn’t provide you with some food for thought…haha. Rounding out the album, Act 5: A New Beginning starts with Hyyerr, which showcases as traditional of Hip Hop verses as you’ll find on Man on the Moon. Real smooth laid back beat to ride out to. Pretty solid, soothing, down to earth track that serves as a landing to the outer space emotionally schizophrenic journey Scotty just took us on. Continuing that vibe is Up, Up, and Away (The Wake and Bake Song) track serving as an sing-a-long happy ending to the album. Common again narrates the conclusion to Cudi’s epic, providing us with a cliffhanger, almost saying to the audience, you’ve heard the story now, but you’re just getting to know him. And truth be told he’s just becoming known to everyone, so you never know where the next novel or play or crazy dream that Cudi will take us on next because his life is going to change as he gains notoriety and success through this album. Numbers are in for first week sales of this album and he came in #4 on the charts in the US and sold 104,294 copies of Man On The Moon. That’s no simple task pushing that much weight with a first album and Cudi, word is bond, I’m gonna throw a party when you’re platinum because you deserve the 5 star classic, 5 headphone rating in my eyes. I didn’t think anyone could give Drake a run for best album of the year, but you have done it and sadly, it is going to be damn near impossible for you to top this first effort. I hope you use that as motivation to prove me wrong.